Last Wednesday night was Halloween and even though I’m generally anti-chips and chocolate bars, I try not to be anti-fun and recognize that getting dressed up and going to people’s houses, getting candy and chocolates is just that, especially for children and as far as I can tell mothers, at least in our house, so we participate in all things that Halloween brings. When I and my wife were kids we enjoyed getting all the treats, except for the gross treats. You know the ones I’m talking about, in the orange and white wrapper, that are hard candies, but are supposed to be soft, and the wrapper sticks to the side and it takes forever to peel off, by the time you do get it off you put it in your mouth only to find that it tastes like a cross between black licorice and excrement, but as a kid you don’t want to waste precious candy, so you eat it anyway. 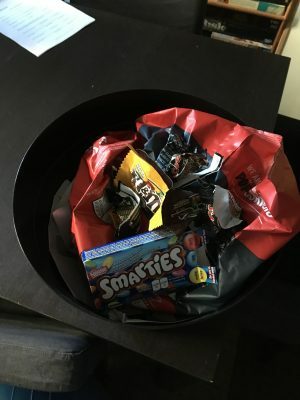 Well, we have a house rule that we will never give out candy like that, because if you’re going to eat something you probably shouldn’t you better well enjoy it, and that’s why we give out mini chocolate bars. We bought these mini chocolate bars about a week before Halloween and they sat up in the cupboard out of sight for that whole time and I didn’t give them a second thought, until the morning of Halloween, around 9am to be exact and my brain out of nowhere started saying, ‘You know what today is don’t you? It’s Halloween and you know what that means, don’t you? Yes it means there will be an abundance of mini chocolate bars floating around your house and the children will come and try to steal them and at first you will let them because there will be many, but when it gets low and you realize there may not be any left over you will hoard them for yourself, because this is the second to last holiday of the year where you can eat whatever you want and you will not be foiled by some children, trying to take your last chocolate bar’ and then I will snap out of eat and say to myself ‘Nope I’m not eating any chocolate bars tonight, zero and I’m going to hold firm on it and this year I mean it. Then a couple hours will pass and I will think, I really do enjoy those miniature chocolate bars and it is only one night and then I will quickly say ‘NO, TONIGHT I’M NOT EATING ANY CHOCOLATE BARS’ and I will be firm with myself. Of course this went on and off all day and I went back and forth always telling myself I would be strong and not eat the chocolate, then when we put the bars in the bowl to give out I held firm and didn’t eat any and I said good for you Jonathan you did it, but then 6:30 rolled around and I started to feel a bit hungry, I mean we had dinner at 4, of course I’m hungry, but I resisted then 7 o’clock rolled around and I thought I’m actually hungry I need to eat something, and I look down at my hands and there’s the bowl of snickers, mars bars and M&Ms, well maybe I’ll just have one, I am hungry after all and I only eat when I’m hungry, so I reach into the bowl and pull out a twix bar, how did that get in there? Then I quickly think, Oh this is better I don’t like these as much and then I put it in my mouth and am pleasantly surprised at lightness of the chocolate, followed by the crispiness of the wafer, followed by the sweetness of the carmel all mixing together in synergistic perfection and I have the horrible realization of ‘Oh I like these a lot more than I realize’ and before I know it I’ve reached into the bottom of the bowl and pulled out another one, quickly I rationalize it, I ‘Oh well, I’ve already had one I might as well eat a bunch, it is Halloween after all then 10ish, okay, 20ish chocolate bars later I have enough of a belly ache that I’ve come to my senses and decided it’s time to take my dog for a walk and then head to bed, I’ve had enough Halloween and I‘m left thinking where did I go wrong? Was it because it’s Halloween? Maybe, I mean we wouldn’t have had it in the house if it wasn’t, except we did have it in the house for an entire week and I never even considered eating it, even though it had been sitting on the table in plain view, for two whole days before. There has to be more to it than that. Or is it because of the fact I started thinking about it in the morning and I allowed it to take over more thoughts and let it consume me for the entire day, with this back and forth of will I won’t I, who knows. I mean I know, because as soon as I gave the thought of eating the chocolate the time of day, I had already lost that battle. I let my thoughts control me, instead of me controlling my thoughts. These thoughts can come in all kinds of varieties, for the dieter that has heavily restricted hid food, it would play something like ‘I’m so hungry, if I only I could eat some food, but I can’t it’s not part of my plan, well maybe when I eat dinner tonight I will have a little extra. Will I workout tonight or won’t I, I want to work out tonight, but I’m kind of tired, then your supervisor comes in at the end of the day and says, ‘hey can you stay an extra 15 minutes to finish this presentation up with me and you say sure, and that makes your decision not to go to the gym really easy because now you don’t have time, you do have to get home to make dinner for your family after all. I’m sure you can think of a time where something like this affected you, where you had this endless debate in your mind, should I, shouldn’t I, will I won’t I and on and on and on and then ultimately you end up picking the option you know you probably shouldn’t and why did that happen, because you gave it to me credence or I should say, we gave it and give it too much credence. This is trickier, because we can’t just say don’t think about it, that will only make it worse, but we also can’t just say what the hell all the time, because then we end up in stasis, never changing anything, giving up on becoming that future version of ourselves that we’re trying to become. But what if there was something in the middle, some kind of strategy that said, I would like a piece of chocolate, but maybe I will wait until the weekend or better yet Christmas, which is far enough away we can put it out of our minds and have this debate then or something like, well I don’t really feel like going to the gym, but maybe I will just do 3 exercises and then call it a day, besides that’s better than nothing or maybe it could be, you know what I am hungry now so I’m going to eat a reasonable lunch, because I know if I get home famished, I’m going to eat anything and everything in sight. Are these strategies perfect, no. Will they work every time and for everyone, not a chance, but at least they acknowledge how you feel, give you a fighting chance and let you know that you are trying to be a healthier person, without it controlling your headspace all the time.